There are 36 Assisted Living Facilities in the Lincolnwood area, with 2 in Lincolnwood and 34 nearby. The average cost of assisted living in Lincolnwood is $5,287 per month. This is higher than the national median of $3,346. To help you with your search, browse the 240 reviews below for assisted living facilities in Lincolnwood. On average, consumers rate assisted living in Lincolnwood 4.4 out of 5 stars. Better rated regions include Glenview with an average rating of 4.4 out of 5 stars. Caring.com has helped thousands of families find high-quality senior care. To speak with one of our Family Advisors about assisted living options and costs in Lincolnwood, call (855) 863-8283. Known locally as the gateway to the North Shore, Lincolnwood, Illinois, is a peaceful town that is home to about 12,590 residents. This upscale suburb of Chicago prides itself on its strong community spirit, which it helps foster with regular community events. Lincolnwood is home to two assisted living facilities, with an additional 34 nearby. In Lincolnwood, as in the rest of Illinois, the Illinois Department of Public Health's Division of Assisted Living handles regulation and licensing for assisted living establishments. Lincolnwood has a very low violent crime rate, which can help seniors feel safe in their community. However, it does have a fairly high property crime rate, which includes theft and burglary, so residents may still need to take precautions. On a scale of one to 100, with 1 being the safest, it rates 22.2 for violent crime, while the U.S. average is 31.1. Its property crime score is 55.3, which is significantly higher than the national average of 38.1. Lincolnwood has an array of community resources for seniors, including a part-time social worker available to help and the Rescue Rangers program, which connects volunteers with seniors in need of help with regular activities, such as shoveling snow. Seniors can also join the Lincolnwood Social Club, which offers drop-in exercise classes and games, as well as scheduled special events. Like the rest of the Chicagoland area, weather in Lincolnwood can be somewhat harsh. Summers tend to be pleasant and have highs in the 80s, and the average high in winter months is often in the low or mid-30s. The area sees about 36 inches of snow a year on average. Residents who rely on public transportation can take advantage of the Pace bus routes running through Lincolnwood that connect it with other suburbs and Chicago or ride the Metra commuter rail line into the city. Seniors age 55 and older can also sign up for the town's subsidized taxi program. Lincolnwood is only 10 miles north of Downtown Chicago, so residents can easily take advantage of the world-class museums and entertainment in the city. The town is also home to the Lincolnwood Chamer Orchestra, a wonderful professional ensemble that makes regular local appearances. While the total cost of living in Lincolnwood is significantly higher than the U.S. average, most of that is due to high real estate and housing costs. Groceries, health care and utilities tend to be slightly less expensive than average. Assisted Living costs in Lincolnwood start around $5,287 per month on average, while the nationwide average cost of assisted living is $4,000 per month, according to the latest figures from Genworth’s Cost of Care Survey. It’s important to note that assisted living rates in Lincolnwood and the surrounding suburbs can vary widely based on factors such as location, the level of care needed, apartment size and the types of amenities offered at each community. 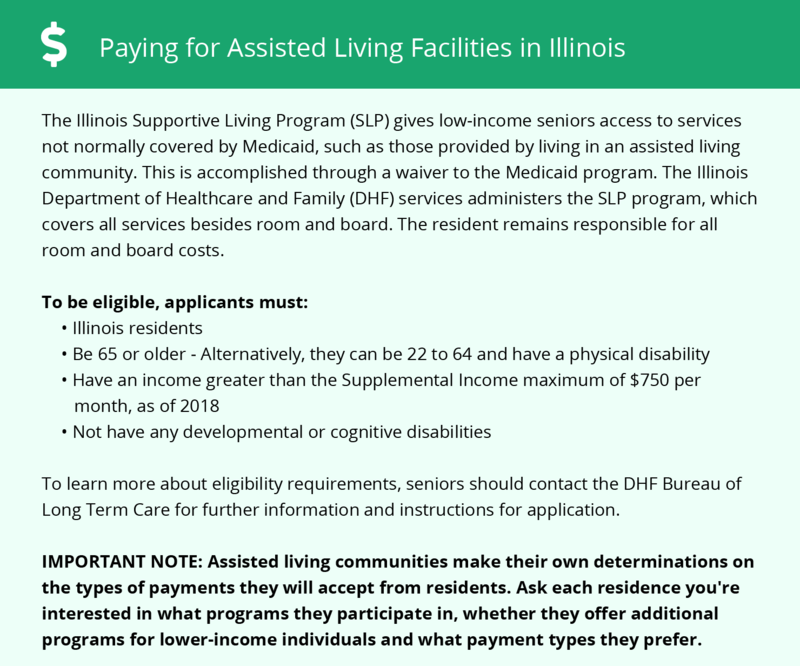 Eligible seniors who need help paying for assisted living may benefit from the Illinois Supportive Living Program, which provides Medicaid waivers to help cover support staff and services that might not be covered otherwise. To see a list of free assisted living resources in Lincolnwood, please visit our Assisted Living in Illinois page. Lincolnwood-area assisted living communities must adhere to the comprehensive set of state laws and regulations that all assisted living communities in Illinois are required to follow. Visit our Assisted Living in Illinois page for more information about these laws.